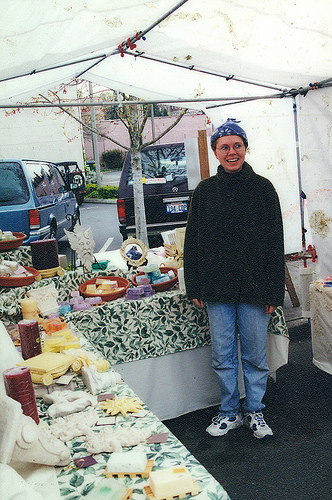 Prior to starting Bramble Berry, I sold soap at local farmers markets. I loved the personal interaction with customers and offering them a premium handmade product. Once Bramble Berry became a reality, my focus shifted to helping other entrepreneurs grow and stabilize their small businesses. Selling handmade soap at a local farmers market. Supporting small businesses in the soap and cosmetic industry has become a top priority of mine. I have experienced the power of this industry first hand, and continue to watch small, soapy businesses change lives. According to a recent industry survey, the Handcrafted Cosmetics Industry is comprised of at least 220,000 small batch producers in the United States. Specifically, more than 95% of those businesses are owned by women. Currently, cosmetics including handcrafted cosmetics and soaps are regulated by the U.S. Food and Drug Administration (FDA) under the Federal Food, Drug and Cosmetics Act and the Fair Package Labeling Act. These laws are in place to protect consumers from unsafe and/or mislabeled products. Over the last several years, legislative proposals have been introduced in Congress that would create new regulations on the cosmetics industry. Unfortunately, some of these new proposed rules would negatively impact small business, including new requirements for manufacturing, products, ingredients, labeling and collection of fees. Click here to learn more. I’ve worked on these issues, along with others including Lela Barker, Donna Maria Coles Johnson, Debbie May, Leigh O’Donnell, Kayla Fiorvanti for over 7 years and want to take the next step in formalizing that work. To help protect small businesses from harmful policy changes, I started the Coalition of Handcrafted Entrepreneurs. By joining the COHE, you will receive updates on legislative proposals to stay informed and empowered. The COHE enables the voices of small business owners to be heard with calls to action that will help lawmakers make more informed decisions. Click here to join The Coalition to receive updates and information about how you can help and stay informed. It’s free. And, I won’t share your information with anyone. Promise. In December of 2014, the COHE team and I traveled to Washington D.C. to meet with lawmakers. In particular, time was spent providing feedback about changing cosmetic regulations to Senator Dianne Feinstein’s staff. The COHE team stressed that while we support legislative provisions that protect the consumer, the unique nature of the industry requires protection for the jobs and economic development the industry supports. While progress was made, legislation affecting the cosmetics industry will continue to be explored. We must be vigilant in voicing our opinions on how future changes could affect our industry. Join me! Thank you very much for posting this article, which I initially found through this article: http://www.soapqueen.com/personal-ramblings/a-day-in-the-life-time-management-tips/. Today, I have joined and subscribed both your COHE mission, as well as the Handcrafted Cosmetics Alliance, in hopes to support this cause any way I can with what means I have. Please excuse my current website content on http://www.7Labyrinths.com, though. It is a template I am editing. I am a soap maker and web designer, and construction has just recently begun on it. But since I am in the design phase (actually of 3 websites I own), I would be glad to include a top or bottom sized banner for this cause, should you have one. Kindest wishes to all of you great contributors of Bramble Berry! Can i join although am in the Philippines? Thank you so much for all you have done and continue to do! You give a voice to those of us who are affected by legislation but have no voice of our own. Can we join even if we don’t yet have a business name or website?